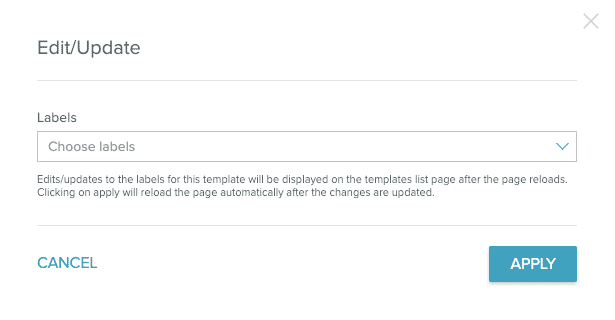 The Templates page includes a list of all your available templates, sortable by date updated, search, and options for filtering by Type, Content, Label, Team, and Archive status. To create a new template, click the New Template button. 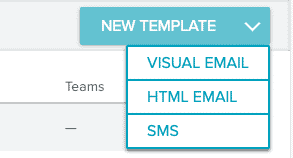 Select the type of template you want to create (HTML, Visual, or SMS), and the appropriate editor will open. The Template List shows the templates you have access to, based on your account permissions. Some template access may be limited based on Team membership. Within the Template list, icons show the type and status of the template, and a thumbnail provides a preview on hover. Each Template listed shows the Name and the Date Last Updated, as well as any Labels and the Teams that have been applied. There are two images to the left of the template Name – the template thumbnail and the template type icon. The first image in the entry is the template’s thumbnail. If the template is empty, you’ll see a placeholder image. The icon denotes the type of template. Visual Email An email template created in Email Composer. HTML Email An email template created in the Template Editor. 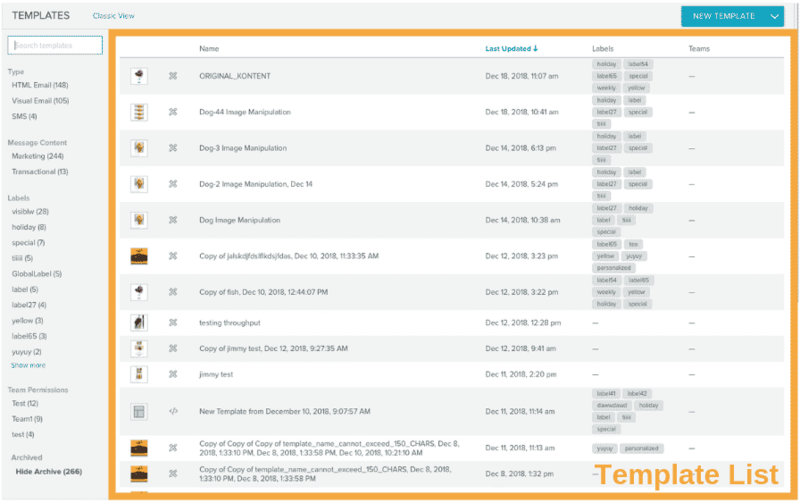 Hover over the end of the template entry to see the Tag and Copy options. Selecting Copy immediately creates a copy of your template. Select one or multiple labels, or create a new label for your template. 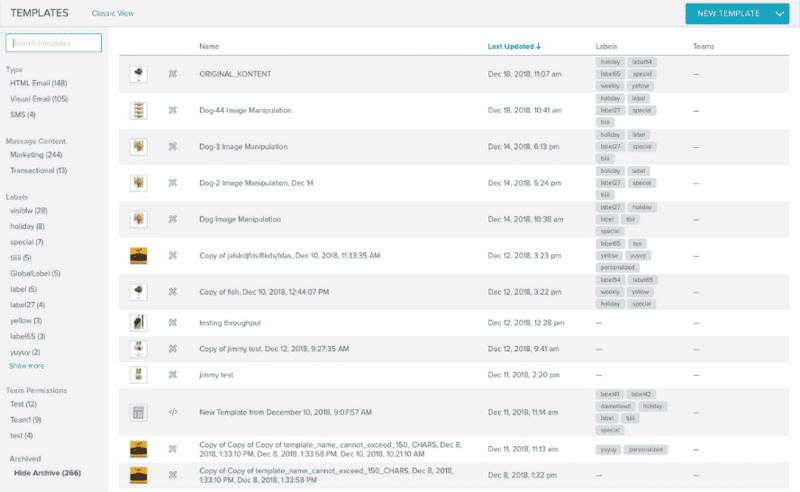 Archiving a template takes it out of your active template list. Archiving doesn’t delete your template or change its status. When you want to get back to your full template list, click Show Archive Only again. To only see active templates, click Hide Archive. Search for and filter your templates from the left-hand sidebar. Search for a specific template by Name from the search box in the sidebar. Results are displayed as you type. Templates can be filtered by a variety of options. Each filter section shows a count of how many templates belong to that designation. Message Content Select the type of campaign content you’d like to see – limit by Transactional or Marketing content. Type Filter by template type: HTML Email, Visual Email, or SMS. Select one or multiple options. Team Permissions Filter by one or more Teams. You’ll see only the Teams you belong to. Set Team privileges in Email Composer or the HTML Editor. Labels Filter templates by Label. 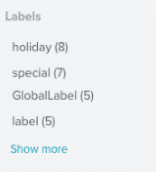 Select one or more of the labels.